John Fallon was the second VI Corps Engineer that I came in contact with after I renewed my search in 2004. I saw his posting on a forum and he talked about an upcoming 36th Combat Reunion in October 2004 to be held in Lebanon PA. So I emailed him, told him who I was and what I was searching for. A few days later, I received an email from John. The photo above was taken in January 1945. Note: John informed me on August 17th, that due to very low registration for the event, the reunion had to be cancelled. Needless to say, he is feeling very low and so am I. I was planning on meeting him and the rest of great seahorses later this fall. John has been my special mentor and he is the one who inspired me to create a website dedicated to my dad AND all the VI Corps Combat Engineers. I will be forever grateful for his guidance, insight and inspiration. I couldn't ask for a better teacher. NOTE: When I had written to John, I thought at the time that dad may have been a 36th Engineer because of the Seahorse/Crown Pin that I had found amongst his belongings. I did not know at that point that he was actually with the 540th Engineers. Thus, John statement below regarding my dad was with the knowledge I had provided him with in my first email. This is a large file (over 30 minutes). This file uses Adobe Flash, as do many of the applications found on this site. If you can't view the file, you will need to install Flash on your computer. If the file frequently starts and stops, it indicates you need to increase your buffer. Right click on the video and change your video settings, by allowing the file to increase its storage. I am very glad to hear from you. I was a platoon leader then finally company commander of H Company of the 3rd Battalion. We have an almost active association and meet once a year in Lebanon, PA. Our numbers are dropping fast for obvious reasons. I send out the letters for the group twice a year and invite them to the reunion. Although there are about a hundred of us left on our roster we get about 40 plus guests at the last couple of reunions and they come from all over the states, California, Texas, Michigan, Arizona and Florida, etc. There are a couple of websites that concern us, 36th Engineers Group (which is still stationed at Fort Benning), 36th Engineer Regiment which is what we still call ourselves. There were 3 battalions and they are now numbered individually since we became a group in February 1945. Now you will find web sites for the 36th Engineer Battalion, the 14th Engineer Battalion and the 19th Engineer Battalion. Your dad's old battalion is the 36th Engineer Battalion and they just finished a hitch in Iraq where they took casualties. Ours is a proud history, we earned more campaign stars than any other regiment in WWII and we made more Combat Landings than any other regiment in either the Army or the Marines. We don't have our own website as the 36th Engineer Association but any of the other sites are familiar with us. If you want anymore information or just want to talk, you know where to find me. I picked up a couple of Purple Hearts during the war and I am not feeling like I did 60 years ago, but I love to talk about the Regiment. Good luck! I had written back to John and asked if it was okay to call him he said I could phone him Sunday evening. What a coincidence I thought, it was D-Day! Quite a day to talk to a WWII vet. We spoke for about twenty minutes and he was very friendly and very willing to talk about the days he spent in the European Theatre of Operations. I had so many questions, but to be honest, didn't really know where to start, so I let him carry most of the conversation. He sounded very proud when he spoke about his regiment and he told me that he received his first Purple Heart in Italy. He was sent to a hospital in Naples and it took him several months to recover. When he got out of the hospital he rejoined the regiment just in time for their next big landing in Southern France. He said it was kind of strange too because of all the new men that were now with him. He said they fought along in France and he was again wounded while trying to get a bridge in at Mertzwiller. Once again he was hospitalized, but because of fierce German resistance, many of the men including himself who were ambulatory, were called back to the front lines. So much for a little rest, healing and relaxation. I asked him to clarify a few things for me including the confusion regarding the 5th and 7th Army Patches and the 34th Infantry Division. I was trying to write all of this down while we spoke and was only hoping that I'd be able to read my furious scribbling on the lined, yellow legal pad, after I hung up the phone. He said the VI Corps engineer units were always a separate entity unto themselves. He also explained that they were 5th Army in Africa and Italy and again after they reached Germany. They were 7th Army in France. Most of the time they were in the 6th Corps which consisted of the 3rd, 36th and 45th Infantry Divisions, plus the 1st Armored. In Italy it included the 34th Infantry Division. Okay, okay it's starting to sink in I said to myself. You can read his letter below helping me to get this all straight. This email is in response to an email I sent to him regarding a conversation I had with Ken Kleinbach, 540th Combat Engineer. The three Combat Engineer Regiments in the 6th Corps, 36th, 39th and 540th were all first class regiments. Both the 39th and 540th spent some time in the line as Infantry but only on a very limited basis. The 36th landed with the first wave at Anzio and H Company of the 36th actually landed with the Rangers (he is referring to Darby's Rangers). After the landing the 540th worked the port but we spent 90% of our time as Infantry. There was always some question about which Regiment was the best and we each thought we were. I think the truth is that the 39th and 540th were probably better engineers and the 36th were better fighters. Probably the main reason we were used as Infantry so much was that we were three battalions which lends the Generals to be able to employ us as traditional infantry, two up and one back. Early in 1942 the War Department ordered all Engineer Regiments converted to Groups but at the judgment of the Theater Commanders. The 39th and the 540th went early in 1944 but the 36th was not converted until Feb. 1945, mostly because they wanted to keep using us as Infantry. For want of better numbering and lack of imagination they were numbered 28--. In the 36th the 1st, 2nd, and 3rd were respectively 2826, 2827, and 2828. None of the guys ever referred to those numbers continuing to use the old battalion numbers. After the war and for the next conflicts the 2826th became the 36th Engineer Battalion, the 2827th became the 14th Engineer Battalion and my own 3rd battalion(2828) became the 19th Engineer Battalion. All three battalions continue to use the seahorse and use the 36th Regiment as their direct ancestor. I am going to defer to John Fallon II. Capt. USA Ret, and forward your email to him. But in the interim I am taking a direct quote from Captain Fallon,"...For instance, we were in the 5th Army in Africa and Italy and again after we reached Germany. We were 7th Army in France. Most of the time we were in the 6th Corps which consisted of the 3rd, 36th and 45th Infantry Divisions, plus the 1st Armored. In Italy it also included the 34th Infantry Division but they stayed behind when the 6th Corps went to France. The 39th Engineers and the 540th were also Engineers for the 6th Corps, both 2 Battalion Regiments and they were almost exclusively Engineers while we were used as Infantry a great deal of the time. We were never assigned to any Division but were usually attached to one or the other and we preferred the 3rd Infantry." You are correct in saying that most of the time an engineer unit acted as a singular unit. This is very true, but they were "attached" to units, be they divisions or smaller units as needed. I got a note from a Marion Chard about assignments of Engineer Regiments in WWII. Obviously an assignment is different from an attachment. While no Regiment was assigned to any division in WWII the battalions of the Regiments were almost always attached to divisions and while we were in Italy our battalions were attached to the 34th Inf several times. Throughout the war the different battalions were regularly attached to different divisions. The only times the 36th was attached as a Regiment to a division was when we were serving as Infantry which happened all too many times. The 540th served as a shore regiment in several landings but they also served as regular Engineer Battalions and on a couple of occasions as Infantry. 36 Engineers are rugged......John Fallon II. Capt. USA Ret. I have the worst of news for you. Our registration is so low that we cannot possibly continue on our reunion plans. Only 17 have registered and of them at least 4 cannot be there because of illness. I am sending out a cancellation letter this weekend. I have never felt so low. I think Seahorses can't cry so I won't but I am very sad. The poet wrote, "Of all sad words of tongue and pen, the saddest are it might have been." I am personally devastated by the loss of a very great tradition. I really hope we can keep in touch. Soldiers and veterans need people like you. These mention the 36th Combat Engineers and I thought John would like to read it. Here is his letter to me. I was surprised and pleased to read the report. They were terrible days, not just with the Germans but with the terrible cold and snow. I lost some good men at Bitche and I think it was almost a full month before we got inside any kind of shelter. I was still not 100% from the wounds I got just the month before. Thank you for your interest in our great Regiment. At one time during this phase of the war I think that the 45th Division actually commanded nine Infantry Regiments, their own, the 36th , and another Infantry Division Infantry which just arrived without supporting troops, Artillery, Engineers, anything. Marion's note: Well the 36th were able to pull off another reunion after being so sadly disappointed at last year's cancellation. 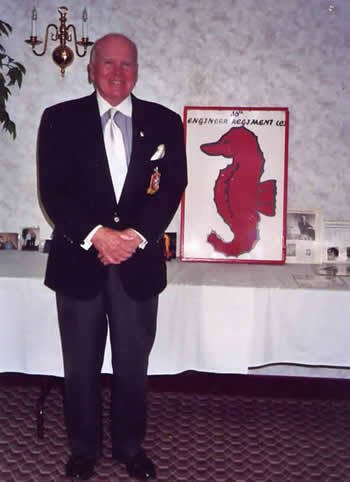 Your's truly was able to attend and was happy to finally be able to meet John and his fellow seahorses. My intention is to be able to post some of pics from that reunion in the near future. What a GREAT group of guys! Essayons! Here is a photo that John sent to me. 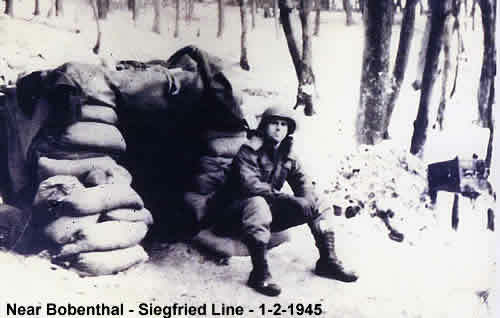 This was taken on January 2, 1945 near Bobenthal in the Siegfried Line. They advanced to the rear at 3 AM the next morning. Marion's note: This timeframe in WWII was the Alsace/Ardennes Campaign - The Battle of the Bulge. Marion's note: The following was in response to a question that I had posed to John regarding his training and awards. Well I never was a hero. The only medal I got was for pulling a couple of wounded guys out of fire. For the most part when I went through the woods with the guys I just kept blasting away at every bush and tree and encouraging my guys to do the same. When in open ground I crawled as low as my belly would let me. No, I didn't earn any medals but I am very proud of the two Purple Hearts, they weren't scratches. Aside from OCS and on the job training as a 2nd Lt in the States my best training came in Africa, mostly from joint Anglo American schools of one or two weeks. The bridge school was nothing very new but the Mines and Demolitions school used live but low powered mines. The British Commando school was very tough, tiring and interesting. They taught us better scouting and patrolling in a much better way than we had learned in the states. But in that war in every war and in today's war you have to learn new tactics. What they are learning now in Iraq will be useless when the next one comes. The stupid media always blames the generals for fighting the last war but that is the way it has always been, nobody can predict the nature of the next war or the enemy until it happens. Just each discipline. I could expand a little on the First Special Service Force. When we were relieved from the Moletta River Front to get scraped off and some replacements we had only a few days to train them.. The Regiment ordered each of the Lieutenants who had the British Commando Training in Africa to go with two non-coms to the Musolini Canal Front with the FSSF. Our job was to learn the terrain and be ready to take over the positions when the Regiment followed up in about a week. I went along with the evening patrols as a rifleman with an experienced FSSF Sergeant leading and my non-coms did the same. It was quite an experience and we learned plenty to run the patrols and raids when the rest came up. The FSSF never got the opportunity to blow out the Heavy Water plant in Norway which they were originally trained for but they did a heck of a job wherever they went. They spearheaded the assault out of Anzio and later went to France to outpost the line between France and Italy. They had been supplemented by the survivors of Darby's Rangers and actually were wasted in France. Eventually they were converted to the 343rd Infantry Regiment and the Canadian Soldiers returned to Canadian Divisions. Marion's Note: In July 2006, I received the following email and forwarded it to John. I got goosebumps when I received his reply. I have always had an interest in WW2 history, but it has primarily been with Armored units in NW Europe. Some time ago, I came across your website because of a personal interest. My girlfriend's father, Wendell M. Ferguson, served with the 36th Engineer Regiment during WW2 and I became interested in what they did. I personally knew Mr. Ferguson and like a lot of veterans, he didn't speak too much about what he did. From his discharge record, I do know that he joined the 36th sometime in late March or early April of 1944 when they were at Anzio. He participated in the invasion of Southern France and was wounded by a mine explosion in France on 9/27/44. He was sent to Marseilles to recover and rejoined his unit in early 1945. I recall him mentioning being at the Rhine River at Mannheim and building one of the largest bridges across the Rhine. (His MOS was listed as Construction Foreman - 059). I know that the 36th Engineer Regiment was reorganized in February, 1945 at which time Mr. Ferguson became a member of B Company 2828th Engineer Combat Battalion, and was discharged from this unit in October, 1945. From his daughter I know he attended several of the 36th Engineers annual reunions in Pennsylvania until his health started failing in recent years. Mr. Ferguson was a dairy farmer in Rock Creek, Ohio for many years, and upon retiring moved to Jefferson, Ohio. He passed away on October 24, 2005 and was buired in Jefferson. Thanks for an excellent website, where I was able to learn a lot more about the 36th Engineer Regiment, and it makes me appreciate what those men did. Wendell was a member of my platoon and one of the very best. He attended most of our reunions and was the last man in my company to join me at them. I can tell this gentleman many stories about Wendell; after a very tough of night fighting on patrol Wendell and my Sergeant and I were walking to the Company Headquarters to beg a cup of coffee and report when we were all struck with the same idea; maybe on the next barrage we can stick our arms up high and get an easy Purple Heart and go home. As it turned out, I was hit within a week, Wendell was hit within two weeks and Sergeant Belcher was hit the week after that. So we didn't have to stick our arms out of the foxhole. We were all out for several months and in fact Wendell didn't get back until one day we were in the front lines again and as soon as I saw him I told him he was going on patrol. He remonstrated that he just got back and so I told him that he was in better shape than any of my other men I think I am the last man alive from my Company or at least I don't know of any other. Wendell was a great friend and one of the best soldiers. While rummaging through his attic earlier this year, John ran across documents that he wasn't aware of. "I had never seen these before", he confessed to me. The following are copies of the original handwritten and official documents regarding his promotion from 2nd to 1st Lieutenant. Proud to announce the latest document from John; his personal memoirs from training to the end of the war in Germany. Beautifully written; a joy to read. The following are comments on the morning reports, which John recently received from the National Archives.